A dynasty fantasy football league is a league where you retain most or all of your players from year to year. This creates an environment which is very different from that of a redraft league. By enabling team owners to keep players and build a team over time, there is a much stronger sense of team ownership. Success is achieved with a greater sense of satisfaction.Mistakes or successes in a dynasty league can affect the fortunes of a franchise for years to come, just like in the NFL. A dynasty league also facilitates trades, including trading of draft picks, and it encourages a deeper roster pool, so young ‘project’ players can be identified and groomed. Dynasty is becoming a more popular format because it is the closest simulation to being a real general manager. Decisions around how to value youth, how to construct a roster, and which trades to make or take has lasting impact on your franchise. Unlike redraft leagues, dynasty leagues are typically active year-round. Owners pay close attention the NFL combine and NFL draft, and actively chat with each other in friendly banter and trade talks during the off-season. Sleeper's best-in-class chat features, modern user interface, and native mobile apps make us a natural choice for dynasty leagues seeking a permanent place to call home. Existing dynasty league hosting sites are very outdated in terms of design, lack mobile apps, and even charge money. Our platform offers the first modern experience for the dynasty player — and is completely free. To start a new dynasty league, simply create a new league, and choose Dynasty as the type. If you played in Sleeper leagues last year and want to renew it as a Dynasty League, you can simply “renew” the league and choose Dynasty as the option. If you were on MyFantasyLeague, FleaFlicker, ESPN, CBS, NFL, or Yahoo! previously and want to continue your dynasty league on Sleeper, the easiest way is to fill out a draftboard with the players in the slots, then create a league out of that draftboard by “completing” the draft as the commissioner. If you want to do your Rookie draft on Sleeper, simply select “Add Supplemental Draft”. 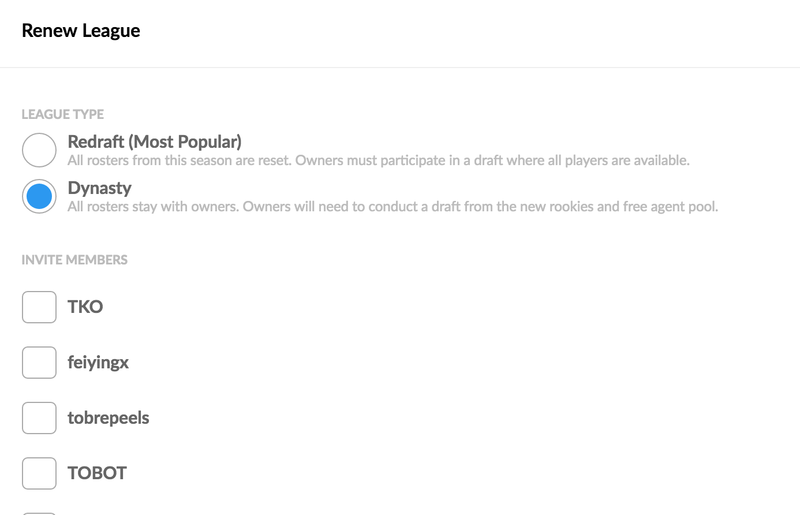 All Dynasty Leagues have draft pick trading enabled by default. 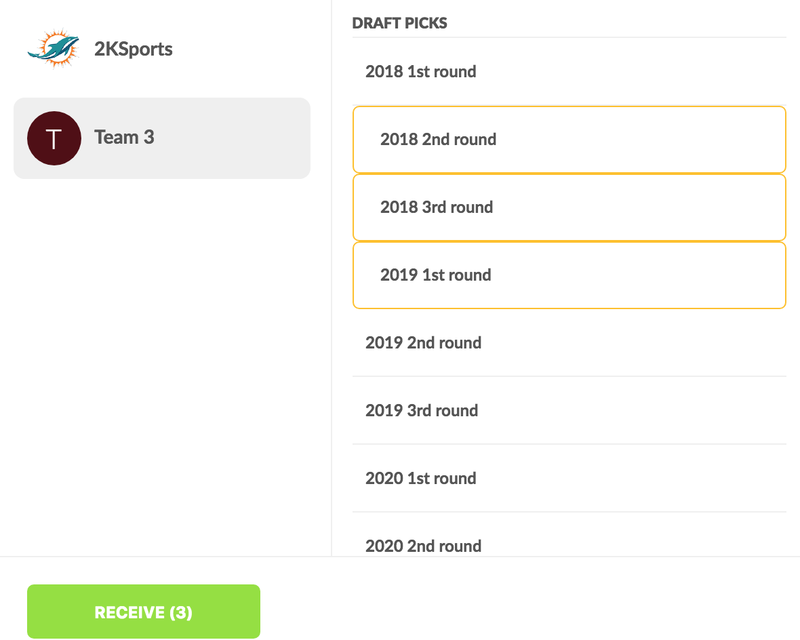 You can now trade picks along with your players, or just picks themselves! We will make draft pick trading available to redraft formats as well later this week. This will ensure each team has the opportunity to develop young talent while making sure that the waivers still have something serviceable to pick up each week. For scoring settings, you can just use what you are already comfortable with in your redraft leagues, whether it be PPR, Standard, or half-PPR. Here are some great places to do your dynasty research. Note that in dynasty, younger players are favored a bit higher, as well as WRs as they tend to have longer careers. If you turn off "Allow Offseason Moves", league mates will be able to trade, but will not be able to make any FA/waiver moves. If your league has a trade deadline, league mates will be able to trade again once fantasy playoffs end even if this setting is turned off.